For a bold color statement that is both right on trend and very hot, consider using various shades of crimson, cardinal, and scarlet red. There has always been a magical connection between the color red and feelings of love and romance; however, today's brides and designers are side-stepping tradition and using red as the primary color for wedding design - not just as an accent color any more. The versatility of red is amazing: not only are there many different hues and shades to build your design around, an inspired designer can create almost any theme or color palette comprised primarily of red. 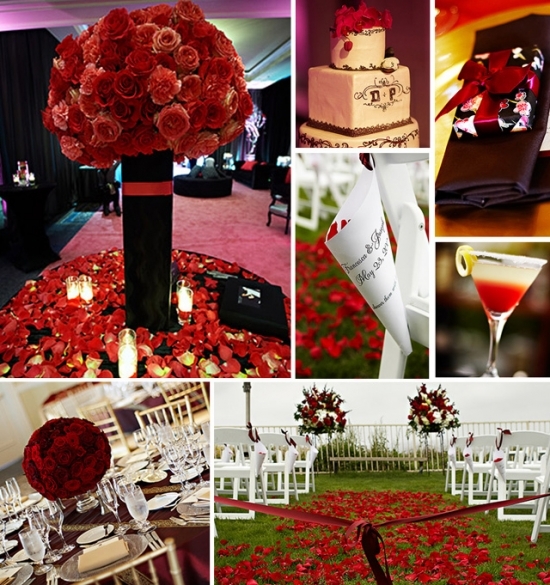 From romantic to vintage, elegant to modern, color your world red! Try a cardinal red paired with a chocolate brown and hints of gold for a wonderful warm Mediterranean feel, or red paired with a black and white damask for an incredibly sophisticated and romantic combination. If you are hoping to inspire your guests with a more modern theme, consider the sophisticated and elegant look of a stylish black and red color palette. This powerful color combination is perfect when trying to incorporate a chic lounge feel into the party. Set the room in black with tall cocktail tables, over-sized chairs, and ottomans. Toss a variety of different shapes and sizes of crimson and cardinal pillows around to create an instant lounge! Red up-lights create a soft glow around the room and a tall black vase with a simple red ribbon accent looks amazing with an over-the-top red rose arrangement. If you need a more economical solution, almost any monochromatic red flower arrangement will make a statement in this simple and elegant vase treatment. You can even incorporate red into your cocktails! A specialty drink made from pomegranate, cherry, or blood orange juice is a fun way to entertain all the senses. The modern lines of Hotel Vitale look great when adorned in red. A chic modern feel can be given to the Bently Reserve with rich, deep, velvety hues of crimson and cardinal red, and for a fun avant-garde look, try exploring red in a location like Bimbo's 365 Club.